"I toldya you know me: the 'real' Rocky." IFC Films has unveiled a trailer for an indie biopic titled Chuck, telling the story of boxer Chuck Wepner from New Jersey, who was the real life inspiration for the character of Rocky. So this is kind of like a closer-to-real-life version of Rocky, but not exactly as you will see in this trailer. Liev Schreiber stars as Chuck, who was a liquor salesman before he went on to fight Muhammad Ali for nearly 15 rounds in a match in 1975. The full cast includes Naomi Watts, Elisabeth Moss, Ron Perlman, Jim Gaffigan, and Morgan Spector. 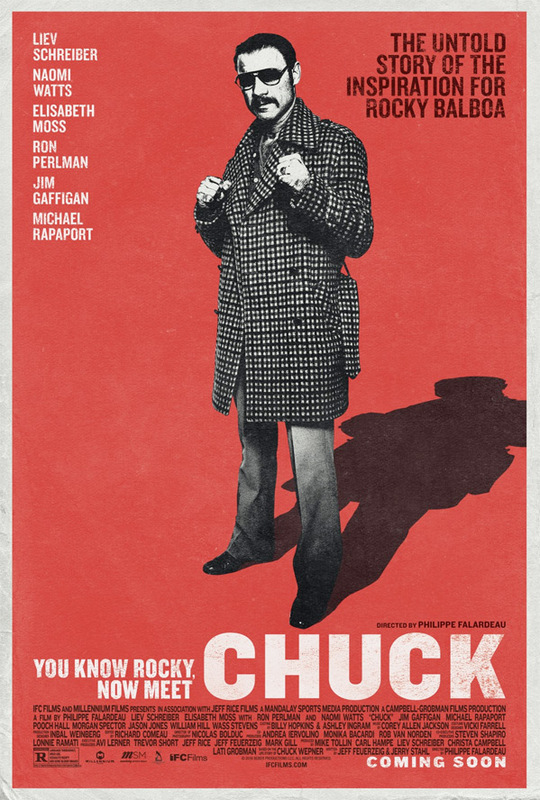 It looks like the film covers Chuck's story both before but mostly after the release of Rocky, earning additional recognition as the person the character was based on. I'm interested in this, but not sure it's really going to be better than any of the Rocky movies. Check it out. He was the pride of Bayonne, New Jersey, a man who went fifteen rounds in the ring with Muhammad Ali, and the real-life inspiration for Rocky Balboa. But before all that, Chuck Wepner (Liev Schreiber) was a liquor salesman and father with a modest prizefighting career whose life changed overnight when, in 1975, he was chosen to take on The Greatest in a highly publicized title match. It’s the beginning of a wild ride through the exhilarating highs and humbling lows of sudden fame -- but what happens when your fifteen minutes in the spotlight are up? Chuck is directed by Quebecois filmmaker by Philippe Falardeau, of Monsieur Lazhar, The Good Lie, It's Not Me I Swear!, Congorama, and My Internship in Canada previously. The screenplay is by Jeff Feuerzeig & Jerry Stahl, and Michael Cristofer & Liev Schreiber. This first premiered at the Venice/Toronto Film Festivals. IFC opens Chuck in select theaters starting May 5th.